We ate a lot of great food on our anniversary. San Francisco is such a delicious city! Who can resist indulging while staying there? Especially with places like Tartine Bakery where we got our pastry craving satisfied. When we got home, I think we wanted to be a bit more salubrious and eat more veggies. My husband has become a big fan of veggie-heavy dishes….except for those with kale….or mixed with quinoa, LOL. I love both, but try not to cook those superfoods as often and just get my fix somehow some place. I blogged about a Filipino-style chicken noodle soup last spring and was craving that, so last night on Halloween we had a different version of it, a veggie-loaded sotanghon (mung bean noodle) soup. 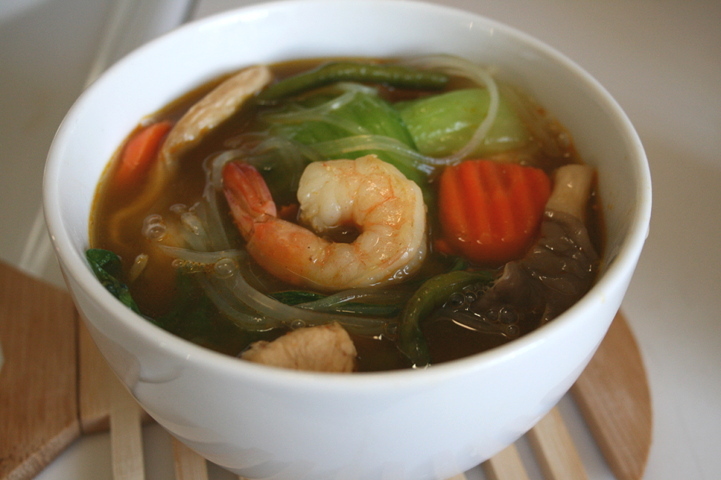 This is similar to my other sotanghon soup recipe, but I added some items for variety–so click over to that recipe for more detailed instructions. In Filipino cooking, there are many different noodle dishes, each with different array of ingredients, especially with the different regions. That’s how dishes are born, I suppose, by tinkering and using what you like and/or what is local. To appease my veggie-hungry husband, in addition to some carrots, I added baby bok choy, oyster mushroms, and sitaw (string beans). I don’t know how to translate sitaw into English that well. All I can say is that it is different than the green beans you often see in the market as they are thinner in diameter and are sold in bunches, as pictured. You would have to get it at an Asian/oriental food market. But, they are so worth it if you can find it. Otherwise, regular green beans (the type you use in green bean casserole) is fine. Basically I used the same soup base, but I was in the Halloween spirit and added more annato for a distinct orange color. I also used more garlic–a whole head of it maybe to ward off vampires. J/k, I just like a lot of garlic. 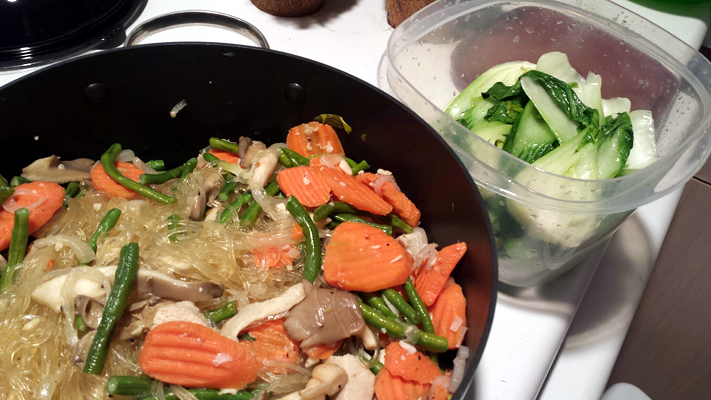 I cooked the veggies and noodles in the broth, then separated them, reserving the liquid. That way, by keeping the veggies, meat, and noodles separate, they don’t overcook and get mushy. There still is some crunch to the veggies, which we like. Feel free to cook them according to how crunchy or soft as you want. 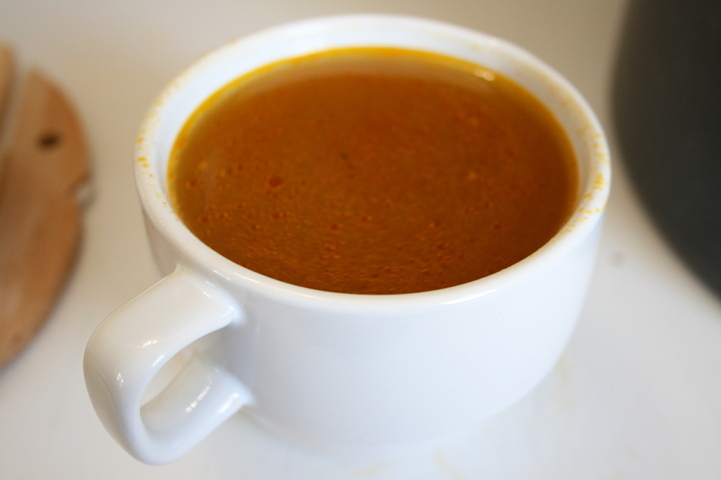 Keep the reserved liquid warm in another pot for your soup base–that’s where all the flavor is! I learned this technique of separating soup components from the broth from my mom. I think we picked at the noodles a lot (sneaking some to the dogs) before dinner. Store the broth separately as well, if you have leftovers. To assemble, I like to start with some noodles in a bowl. If you want to use other types of noodles, go ahead! Rice noodles would be good here too, then it would be called bihon soup and would be similar to the Vietnamese pho. If you use egg noodles, then you have mami soup! 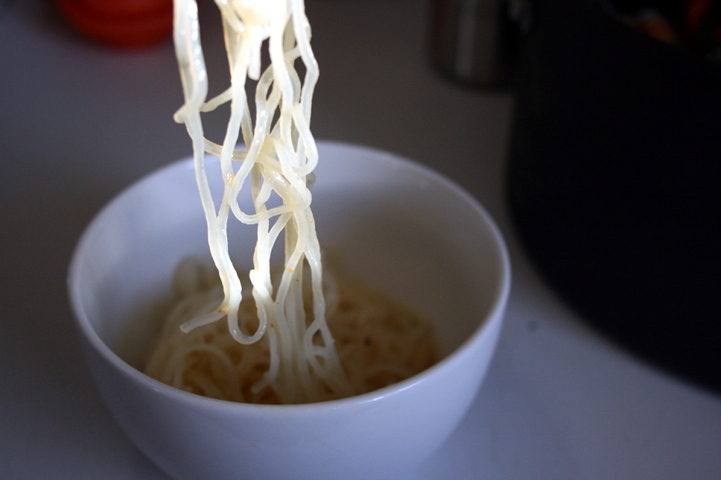 There are lots of noodles that you can experiment with! Then add some veggies and a bit of chicken and shrimp. You don’t need to add any animal protein and can use vegetable broth, if you want to keep it vegetarian. 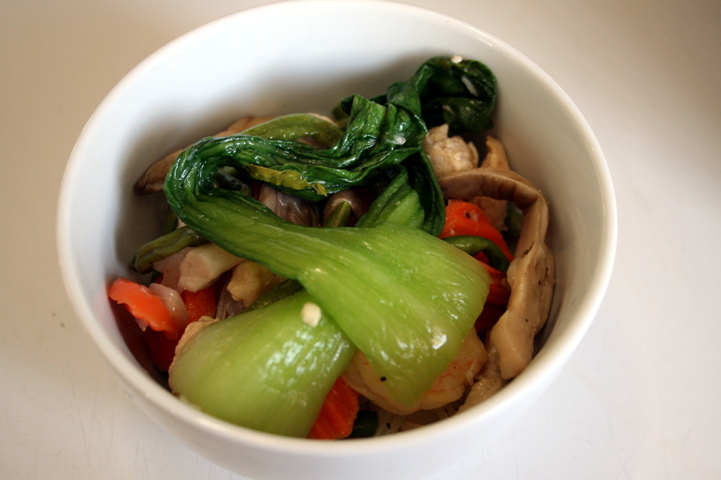 Don’t forget the bok choy! It’s one of my favorites lately. I think that my husband has grown to like it. Mix it up a bit. Then add the orange-colored broth. In a large pot, sauté the onion and garlic on medium heat in the oil until softened and fragrant. Season with salt & pepper to taste. Keep stirring so that the garlic does not burn. It should be lightly browned. Mix in the bouillon and cubed chicken. Sauté for about 5 minutes until chicken is browned. Add the chicken stock, fish sauce, and annatto powder. Let it come to a boil. Add the mushrooms. Turn the heat down and simmer for about 10 minutes. Set the chicken and mushrooms aside. 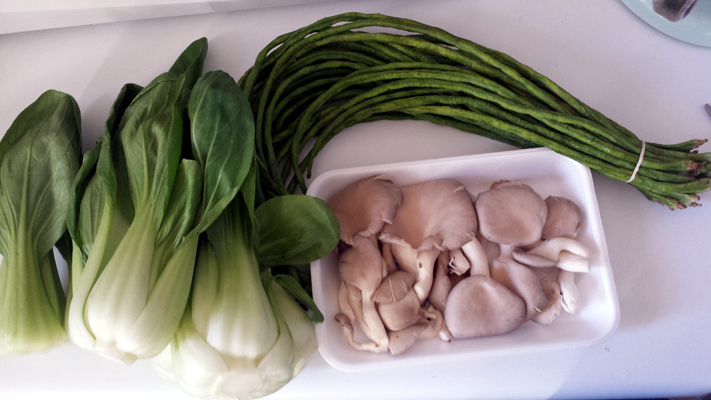 Add the bok choy to the broth and cook for about a minute or two then set aside. Boil the carrots and sitaw in the broth until softened, but they still have some crunch. 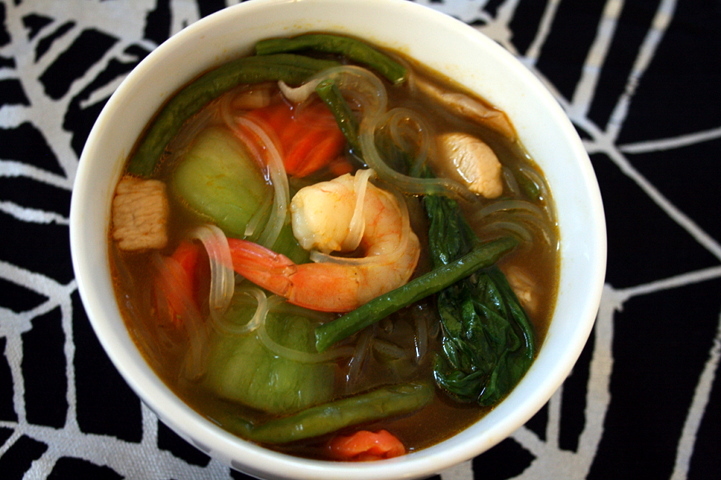 After the veggies are cooked and set aside, immerse the sotanghon in the broth and cook a few minutes until softened. Set aside with the vegetables reserving the liquid in the pot. Keep the broth warm until ready to serve. 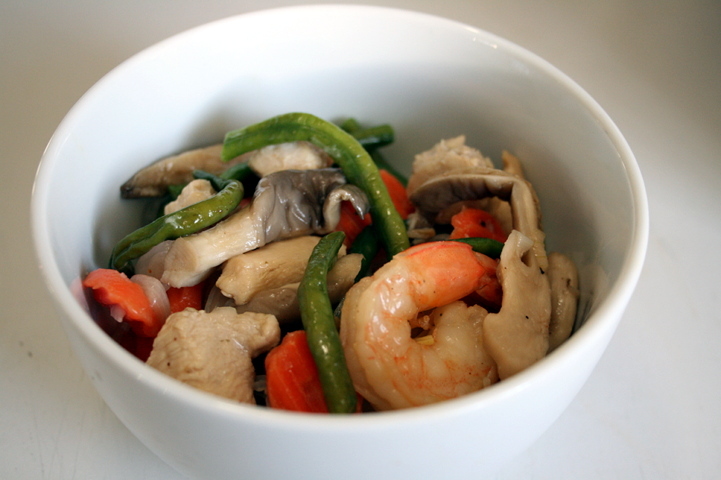 To assemble, place some cooked noodles in a bowl, then add some of the cooked vegetables, chicken, and shrimp. Top it off with the broth. Serve with green onions and toasted garlic, if desired. What’s great about this type of noodle soup is that you get a lot of flavor without slaving in the kitchen all day like a lot of soup recipes require. Maybe just an hour or less of kitchen time (not including cleanup!). It’s the ultimate quick comfort soup while waiting for trick-or-treaters, even if we only had two kids come by. 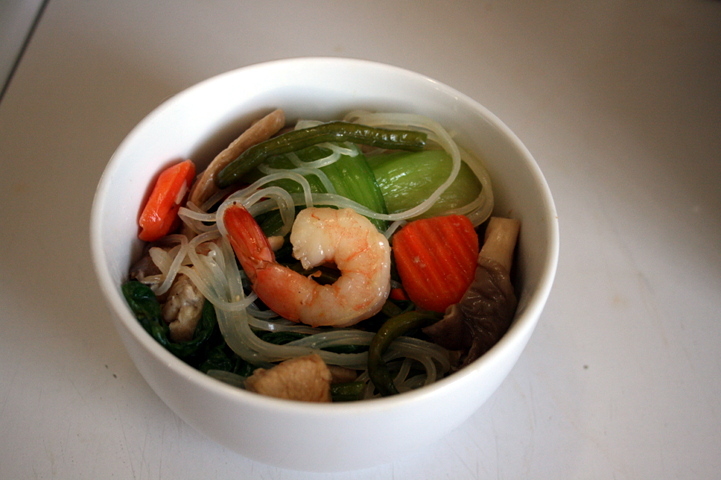 This entry was posted in Cooking, Food, Recipes and tagged Cellophane noodles, Chicken soup, Filipino food, Halloween, mung bean noodles, sotanghon, soup, vegetables. Bookmark the permalink. looks really yummy & spicy! Thanks Liz 😀 I think my mother-in-law once said that those type of noodles, when clumped together, reminded her of brains or something, LOL. Glad that they can look good as they really are. Beautiful soup, It’s loaded with all sorts of goodies. Sounds like you had a great time in SF! Thanks. Can’t wait to go back! 🙂 Thanks! Sorry for the late reply! I need to be more on top of wordpress! This looks yummy. What does sotanghon mean? Thank you very much. 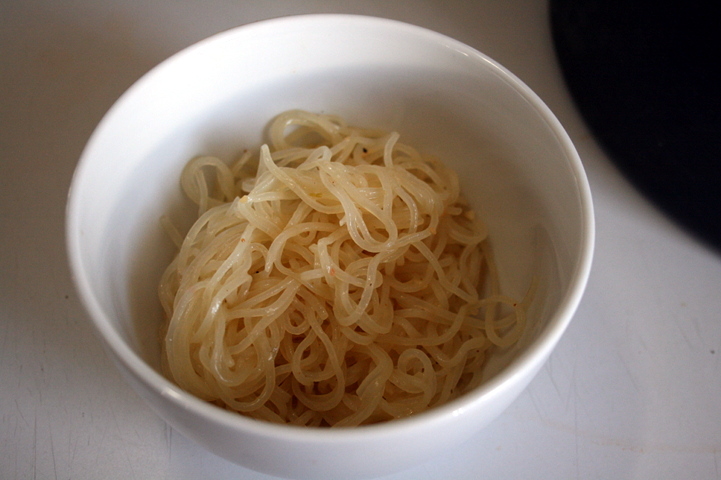 Sotanghon is mung bean noodles/threads or also called cellophane or glass noodles due to the look. Looks and sounds wonderful Samantha! Thank you 🙂 Definitely a nice meal! I love sotanghon soup! Yours is so colorful. 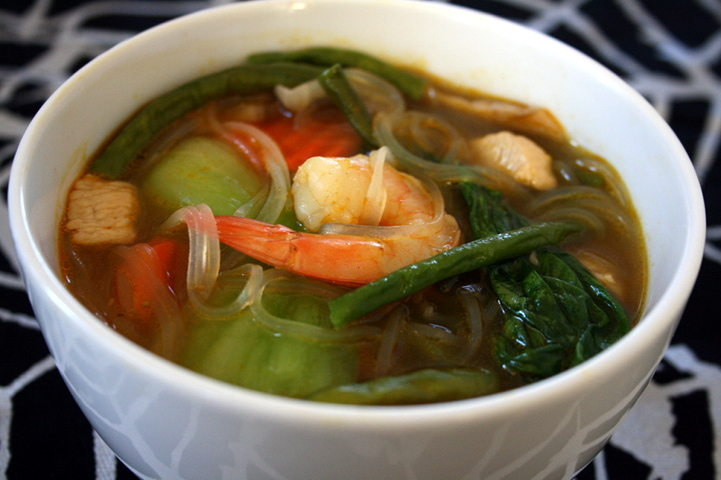 My grandfather used to make sotanghon soup when I was a kid. He served it on new year’s eve, a Chinese custom to wish everyone a long life in the new year. Also, the ingredients he added had symbols. E.g. quail eggs for fertility, shitake mushrooms for flavor, greens for a life of plenty, topping of crisp scallions for prosperity, etc. something like that. I finally have access to my list of followers (my daughter set up the blog and only made me an editor, so I could not tell who was following me). . I noticed your sotanghon soup and I think it is something I will have to try. In your discussion, you mention that you did not know how to translate “sitaw.” In America they are usually sold as “long beans,” http://en.wikipedia.org/wiki/Vigna_unguiculata_subsp._sesquipedalis.